Last night I drove over to Sydney around 5 PM, and drove to the end of Esplanade to the Victoria Park buildings. I parked and went inside to register. I was there for the first meeting of a group called “100 Women Who Care CBRM” and was excited to see how it was going to go! Joyce Rankin speaking on behalf of Habitat for Humanity, which was the first charity of the three to present. It’s a simple concept. Every member brings a $100 blank cheque to the meeting. Three charities get to present a five-minute snapshot of what they do and why they deserve to be chosen. The members vote and the votes are counted, and then the winning charity receives the total raised, which would be $10,000 if the group were numbering 100. But there is no cap on members, and the group is currently at 136 members! 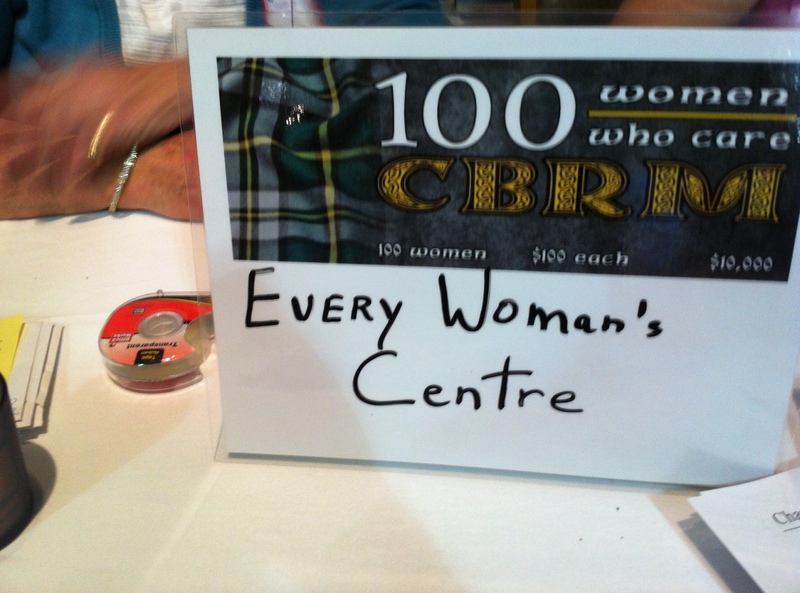 So the winning charity last night — which was the Every Woman’s Centre, rather appropriately — received $13,600. That’s an amazing chunk of change, especially for a local charity that works so hard with so little! Before the voting there are snacks and everyone mills around and chats, catching up with friends and meeting new ones. After the voting, a long line forms at a table to hand over the cheques and the self-addressed envelopes for your tax receipt. You’re welcome to stay and nibble more, and chat more. And that’s it! Quick, simple, fun, and powerful. 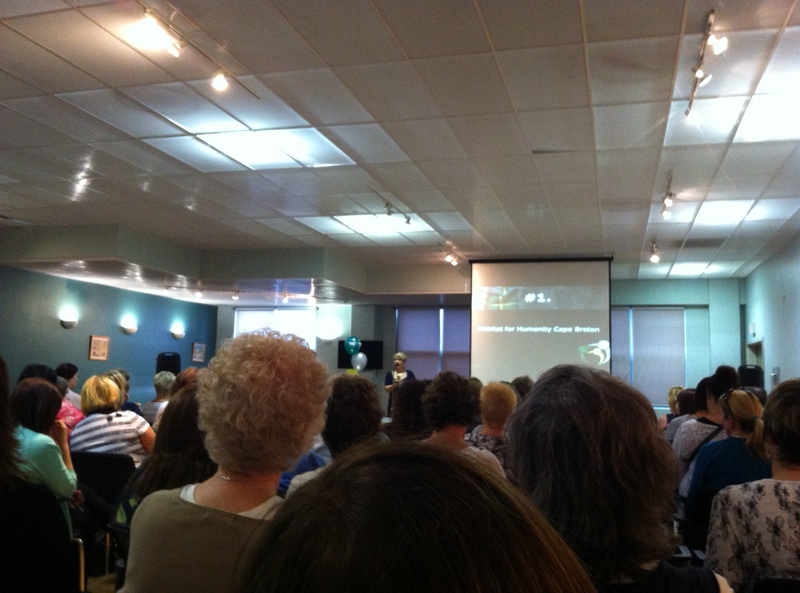 I’m so glad I went, and look forward to the next meeting in September. Crowd-sourcing on the Internet is pretty rad, but getting together with local women to support a local charity felt even more powerful. This group is for charities within the Cape Breton Regional Municipality, but there was chit-chat last night about starting something similar in other three counties on the island. There is also a men’s group in the works for the CBRM. There are similar groups all over, too: Halifax has 100 Men Who Give A Damn, as well as a 100 Women Who Care group, and Truro just started one, too. As for the amount of money, it’s $100 every three months. At first I thought “Ah, I can’t afford that!” But then I took another look at my budget, and decided that I could. I’ll drink a little less wine, and maybe go to a thrift store instead of buying a brand-new top. The value of being a part of this group, and of contributing to the community right here around me, means more than $100. Is it cheesy to say it’s priceless? Hehe, probably. But you know me, I’m going to say it anyway. If you haven’t already, consider joining the 100 Women Who Care CBRM, or helping to start a similar group in your county! Get in touch with the CBRM group’s founder Deana Lloy for more information. This entry was posted in Community, Towns + communities, Women + kids and tagged 100 Women Who Care, Cape Breton, Cape Breton Regional Municipality, fundraising. Bookmark the permalink.